Our Lady of Angels, or of the Portiuncula, is located six hundred yards from the city of Assissium, in Italy. It was a desolate locality, and apparently an unsettled one where robbers and the lawlessness flourished, for the Benedictines who had lived at the monastery felt it was too hazardous to remain there. They abandoned the monastery, relocating to Mount Subasio, which was a fortified monastery. The original chapel is thought to date from the 4th Century, and was built by holy hermits who had come from the Valley of Josaphat. It is said that they brought relics of the Blessed Virgin with them to the region when they constructed the chapel. The history of the feast is inspiring. St. Francis of Assisi, in the early days of his conversion, while he was still uncertain as to what path to pursue, was praying earnestly for enlightenment before the crucifix at the Church of San Damiano, when he heard within him the command of the Crucified: "Build up my house, for it is nearly falling down." Taking the words literally, Francis began to restore San Damiano and other dilapidated churches in and near Assisi. The most famous of these was the church of Our Lady of the Angels. Some time after the restoration of this little chapel, an angel told St. Francis to come to the Church of Our Lady of Angels, or Portiuncula. There he found Our Lord, His Blessed Mother, and the Angels waiting for him. Our Lord commended Francis because of his zeal for the salvation of souls, and promised to grant him whatever he should ask in behalf of sinners. St. Francis asked for this great favor: that all those who came to this church to pray and, truly sorry for their sins, confessed them, should "Obtain in perpetuity a plenary indulgence" so that they would have nothing to account for when God called them. This was the great favor he asked, but Our Lord granted it to him through Mary. When Saint Francis came upon the little, run down and abandoned chapel of Our Lady of Angels, or Santa Maria degli Angelis, in the year 1208, it was almost completely hidden in shrubs and brush. Saint Francis entered the hidden church, which measured only twenty-two feet by thirteen feet, and saw the ancient fresco that had been placed above the main altar. 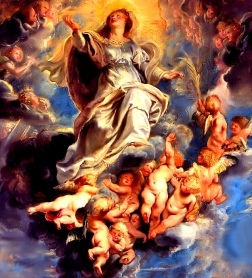 It was an image of the Assumption of the Blessed Virgin surrounded by angels. Some say that this is why the chapel was named Our Lady of Angels, although there are also legends that angels could often be heard singing there. The place took its name, the Little Portion, or Portiuncula in the native Italian, from the small section of fertile land that was gifted to the monks for them to work for their support. It is said that this was the place where Saint Francis first understood his vocation, received visions, and was also where the saint desired to live. The Benedictines had lived at that location for hundreds of years, but the Benedictine monks gave this chapel to Saint Francis upon his request. It was certainly here that the Franciscan Order was founded. At first Saint Francis wished the convent which he built there to be the principal one of his order. He assembled the first General Chapter there, where there were five thousand religious. It was also where he yielded up the ghost on October 3rd in the year 1226, the twentieth of his conversion, and the forty-fifth of his age. The cell in which the poor man of Assisi died can still be seen where it rests against one of the columns of the cupola under the choir bay.